The Music Man tells the story of a con man who poses as a band leader and sells equipment to naïve Midwesterners who think he will train them to become proper musicians. It’s a story of love, following your heart and embracing growth. It’s also a story that began Zach Callison’s career. When a production of The Music Man was holding auditions in Callison’s hometown of St. Louis, he was only 7 years old. The age requirement to be in the children’s choir was 8, but didn’t stop him (with some encouragement from his dad) to audition anyway. He ended up receiving the lead children’s role. He spent the majority of his time singing until he landed a small role in the film Ghost Image. It was after that gig that he told his parents he preferred acting on a set versus acting on a stage. From there the Callison family moved to Los Angeles, and Zach began booking voice acting roles. From Scooby Doo to The Legend of Korra, he ultimately scored main characters on Sofia the First and Steven Universe. Music was placed on the back burner as he focused on his shows and felt that he didn’t yet have a grasp on what he wanted to contribute musically to the world. Things ended without a true sense of closure, and Callison knew it was only a matter of time before one of her songs about him was released. It started as a side project, meant solely as an expression of art and not art that would be released into the world. Then one song turned into two, and two turned into his EP being released this spring, A Picture Perfect Hollywood Heartbreak. The EP is unconventional in more ways than one. While only a five-song EP, Callison intertwined several interlude tracks that became more along the lines of an LP. He also drew inspiration from albums like To Pimp a Butterfly and used a narrative approach to his songs. 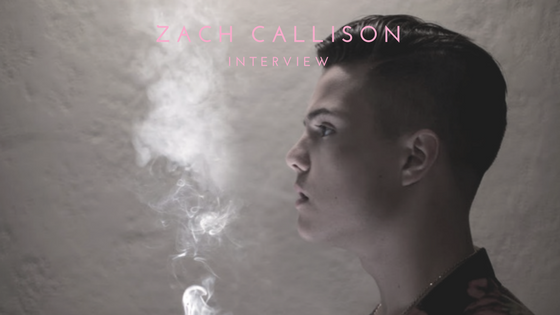 Zach Callison may not be The Music Man in terms of being a con artist, but he’s embraced growth and has followed his heart back over to the music side of the industry. With his debut single, “War!”, making headlines and his EP on the way, the glimpse into his evolving personality is more than just a character’s voice.